The winning run continued for us at Pakenham yesterday with Eagle Ridge winning again and we have two chances to continue the streak at Seymour on Monday. Irish Charger runs in race two, the 3YO Maiden Plate over 1200m with Jordan Childs to ride from barrier one. Mike Moroney said it is a good race to get the son of Helmet started off. “He’s always been a horse we’ve liked and he’s worked nicely coming into this,” Moroney said. “From barrier one he should be able to put himself there with his gate speed. Metson (pictured) runs in race eight, the benchmark 64 handicap over 1414m with Jordan Childs to ride from barrier two. The four-year-old son of Canford Cliffs won over 1400m at Seymour on a soft track last time out on March 27 and has pleased Moroney since. “He’s trained on nicely, nice and bright and we’ve just keep him ticking over,” Moroney said. “He’s drawn nicely but I’m just a little concerned being on the inside late in the day. 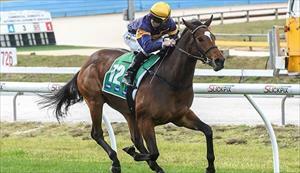 Eagle Ridge was our sixth winner this month and continues the good run of form for the stable.